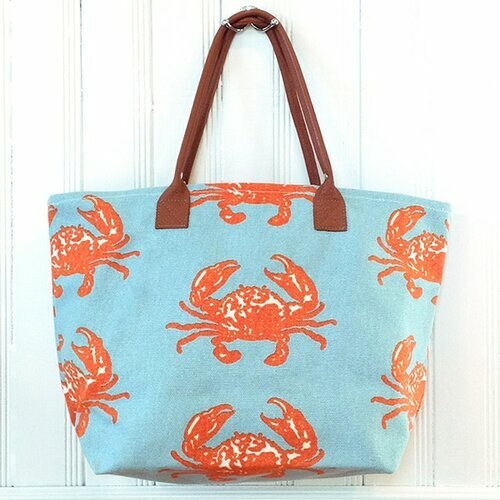 Crab Beach Tote in Navy & Nantucket Red. Fresh, crisp and coastal, this 100% cotton canvas tote is perfect for carrying beach towels to the shore, or toting a picnic lunch! Durable, yet lightweight for its generous size. Measures 20" wide x 15" high (excluding handles). 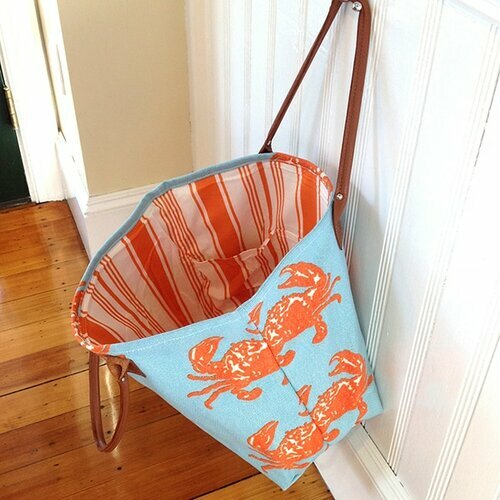 Our original crab print is hand-printed using eco-friendly materials and methods and is crafted locally in New England. Buttery soft brown leather handles are well-proportioned to wear comfortably on the shoulder. Coordinating 100% cotton stripe lining features three storage pockets to organize your phone, wallet, and sunnies. Care: spot clean for optimal color retention.